It's been a while since the last History of Rugby posting, so today we continue with the next two parts as this fascinating documentary picks up with the 1974 British & Irish Lions in South Africa. In the previous part there was talk of the physical nature of the tour, with the infamous ’99 call being a big talking point on a hard fought series. As the Lions won the first Test, South Africa was thrown into turmoil as they didn’t know how to deal with it. The same followed in the second Test, as the visitors played some fantastic rugby. By the time the third Test came around, tensions were high as both sides exchanged some devastating blows in what were some ugly scenes. The Lions went on to win the match though, and pick up the historic series win. It was also a great period for Welsh rugby, and by the time the next Lions tour came around in 1977, they were feeling confident against New Zealand. That was to be an entirely different tour altogether though. By 1980 England rugby had picked up again as Bill Beaumont’s side won the Grand Slam, including a famous win over Wales with a last minute penalty kick by the aptly named, Dusty Hare. In 1981 it was the year of the infamous Flour Bomb Test in New Zealand, a match that was marred with protests, violence, and one man flying an airplane around the stadium while dropping flour bombs on the field below. Isolation followed for South African rugby for the next decade due to the right wing governmental policies that were in place at the time. The Wallabies toured the British Isles in 1984 on their Grand Slam quest as they managed to beat each of the home nations, with young David Campese coming to prominence. Scotland won a Grand Slam of their own earlier that year, taking the Five Nations Championship. The two parts below are posted as a playlist for simplicity's sake. Just hit play once, and the second will follow after the first. If anyone has any trouble with the playlist, please shout. Awesome, I've been waiting for this update! Thanks, RD. hahahah did they really do a haka during the middle of the match to distract the other team?! Haha yeah it seems a bit cringeworthy now but you gotta remember it was during the amateur days so they were just having a laugh and would have joked about it during the after match p!ss-up. I would say that describing the sporting boycott of South Africa as being due its "right wing governmental policies" is a little disingenuous. It was specifically apartheid that the rest of the world took issue with. However, a minor gripe for some great clips. I've seen a video interview somewhere with that Kiwi flour bomber. An important protest. 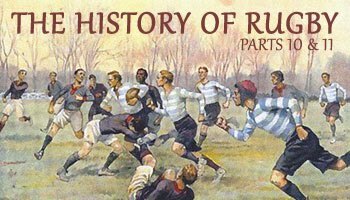 The history of rugby or the history of rugby in the British Isles? RD - can we please get some more close ups of Rob Andrew's head? The man is hypnotizing. Anonymous said... I would say that describing the sporting boycott of South Africa as being due its "right wing governmental policies" is a little disingenuous. It was specifically apartheid that the rest of the world took issue with. I agree, it was really all about apartheid, a few right wing policies never interrupts rugby or we wouldn't have any at all. Strange how Andrews says that Muldoon was "President" of New Zealand!! NZ is not a republic, he was Prime Minister, and a right wing one too. Interesting stuff all the same, and there was some serious speed in those Lions sides. Perhaps the term was misused, but in SA the right-wing usually referred to those who supported apartheid and wanted white & black to be separate. great to watch these oldbclips, but man is it the wales, england and scotland show. Mise, its pretty much England produced, hosted, focussed etc. You should have seen the intro (that I cut out). There's a very English ending too, but I'll try keep it as neutral as possible. France gets a quite a rough ride too. I love you RugbyDump. You make being a rugby fan in the US possible.